Posted by admin in Bezymianny, Kamchatka, Kliuchevskoi, NASA Earth Observatory, Russia. The NASA Earth Observatory is currently showcasing a stunning image – two volcanoes erupting simultaneously on the far-eastern Russian peninsula of Kamchatka. The two are Bezmianny (bottom) and Kliuchevskoi (top). This false-colour image was captured by the Advanced Spaceborne Thermal Emission and Reflection Radiometer (ASTER) on NASA’s Terra satellite on 13 February 2010. Very interesting. Are the volcanoes linked in some way, either chemically (i.e. magma movements) or mechanically? 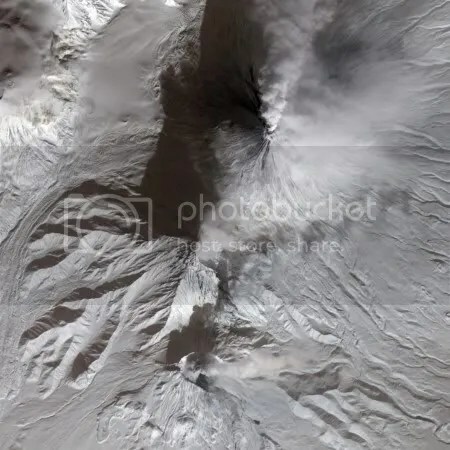 I know there’s evidence for this in some volcanic systems (Katla and Eyjafjallajokull in Iceland, and another one in Kamchatka if I remember correctly, in which eruption of one volcano triggered a collapse and subsequent caldera formation in a neighbouring volcano) – is there something similar going on here? They are vesry clse together but I don’t really know if there is any way to know for sure as we can’t see what is going on down there. SACS SO2 notification this afternoon appears to show a gas emissions source in Vanuatu, probably Ambrym again (reported to be in continuous eruption since May 2008). @James: yes, some volcanic systems seem to link nearby volcanic edifices, Karymsky and Akademii Nauk caldera are the example you have in mind, where simultaneous eruptions occurred in 1996. The Katmai-Novarupta (Alaska) link during the gigantic 1912 eruption is maybe the most famous. Then, there seem to be many such links in Iceland, Grímsvötn and the Laki fissure is particularly extensive, and Katla-Eldgjá is a similar case. Forgot to respond to the second part of your question, James. Bezymianny and Kliuchevskoi seem to be entirely independent volcanic systems, which is quite amazing, if you consider how close and how extremely active they are. @Boris: Thanks for that. If they really are seperate then it is indeed pretty amazing. Iceland’s volcanism is strange in that it’s generally considered to be comprised of ‘volcanic systems’, which generally have a long fissure swarm plus a larger central volcano capable of producing more silicic magmas. My understanding is that this has mainly to do with the fact that the lithosphere is effectively weaker in one direction than the other due to the stresses in along the plate boundary – the volcanic systems are linear and all run parallel to what is considered to be the plate boundary (things get a little weird in the south and around the Hreppar microplate, but the same idea prevails). The only systems that do not show this form are very young ones – for example, the Vestmannaeyjar (Westman Islands) system, or Hekla. Then again, Hekla is a bit weird anyway, being pretty much the only Icelandic volcano to produce basaltic andesites, so it may be something of an exception to this ‘rule’. The occurrence of silicic magmas in the central volcanoes is possibly either due to crystal fractionation or partial melting within the shallow magma chambers – although there is still a lot of debate here, it seems most likely that it is a combination of the two. There is a lot of literature relating to the nature of the volcanic systems in Iceland, and it’s pretty interesting to read. Anyway, in the case of Katla, the Eldgja fissure eruption was still within the Katla volcanic system, but occurred along the fissure section rather than at the central volcano. Similarly, the Laki eruption was within the fissure section of the Grimsvotn volcanic system. The systems can certainly be confusing sometimes, because of the sometimes different names for the fissure zones and the central volcano. Actually, looking again at the Vatnajokull seismic information, a lot of these earthquakes have a pretty poor reliability rating. They need to be vetted by humans – they are currently using computer location-finding algorithms. Therefore it could be an unnatural cluster, I guess, and they may spread out. Regardless, it seems a much higher density than I usually see around there. Keep an eye on it.